I can’t unlock this phone and it’s driving me crazy sitting in the box it came in. I have to get rid of it. So it’s for sale. 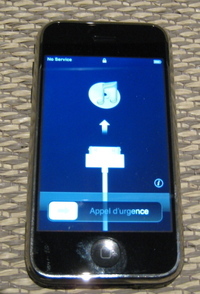 A brand new 1.1.2 firmware iPhone. The best offer I get by midnight monday, Dec 10th gets the phone. The minimum bid is $249, a $150 discount. Hopefully I’ll do better. This is the last iPhone I buy directly from Apple. From now on, I am only buying unlocked iPhones. Newer post The News Feed – A Powerful UI Innovation Older post Has Anyone Unlocked The New iPhone That Comes With 1.1.2 Firmware?